The seeds were sown in Gujarat, and the current attack on activists over the Elgaar Parishad event only shows their nervousness. This abhorrent phrase ‘Urban Naxal’ is in my opinion a part of the BJP’s sinister design, and propagated by the ‘Urban Idiots’ it has unleashed. My experience from Gujarat tells me that this culture of impunity and the framing of charges against human rights activists are only a repeat of the Gujarat Model, which is now being played out on a pan-India scale. Today, there is a so-called plot by alleged Maoists to kill Prime Minister Narendra Modi, as per some of their party members, certain media outlets and a section of society. Which Maoist leader or alleged terrorist would be so childish as to write such an “assassination plot letter” to another Maoist and have it on a laptop? A similar ploy was devised a few years ago when Modi was the chief minister of Gujarat. When the ‘Vibrant Gujarat’ development pitch wasn’t enough to fool our state’s gullible masses, the government helmed by him started a series of alleged fake encounters to convince people that Modi’s life was in imminent danger. The cases of Ishrat Jahan and Sohrabuddin may still be on, but just look at Mufti Abdul Qayyum. The man spent 11 years in jail for the Akshardham temple terror attack only to be finally acquitted by the Supreme Court in 2014. The lower courts in Gujarat had convicted him on grounds of terrorism. The Parishad was planned by two highly respected retired judges, Justices Kolse Patil and P.B. Sawant. Radhika Vemula and Prakash Ambedkar also participated. We Dalits may only constitute 7 per cent of Gujarat’s population, but nationally we are no less than at least 17 per cent. In Rajasthan, Madhya Pradesh, Uttar Pradesh and Bihar, Bahujanvaad is gaining ground and mobilising voices of opposition. The BJP is scared because Modi has no answers for lack of jobs, rising atrocities, crime against women, failure of demonetisation and a widespread dissatisfaction with the government. No wonder then that it needs to call outspoken Dalit Bahujans and their supporters as ‘Urban Naxals’. It is an obvious diversion from their policy failures, and a way to deflect public attention from real issues in states at a time when Dalits are asserting themselves politically. During this Elgaar Parishad event, I gave a speech wherein I said my becoming an MLA alone won’t change the status quo and that all the oppressed should take to the streets to reclaim their rights and fight back. But few days later, after violent clashes took place in Bhima-Koregaon, fomented by the likes of Sambhaji Bhide and Milind Ekbote, my speech was distorted by some news channels. I was accused of inciting “street wars” and violence. I am facing an FIR on charges of instigating mobs for one of my most progressive speeches. This shows how the public is being fooled by those in power. I was never against Brahmin individuals, but Brahminism – yet I have this FIR against me. Those spreading falsehood forget one fact: unlike them, we don’t believe in targeting any one caste, but believe in annihilating the caste system itself. All the recent raids and arrests show that they won’t spare anyone. Already Dalits, Muslims, Adivasis languish in disproportionate numbers in India’s prisons. But now a lawyer appearing for them in the court is also targeted! Laws such as the Unlawful Activities (Prevention) Act too have been designed in a manner that allows this injustice. It has been misused to frame Ambedkarites and Adivasis as Naxals. Be it the BJP or the Congress, no government should ever come up with such draconian laws. The National Security Act has been used to put a Dalit leader like Chandrashekhar behind bars. Ours may be the only country where the outfit (Sanatan Sanstha) allegedly sponsoring the killers of Dabholkar and Gauri Lankesh goes scot-free but human rights activists get jailed! Most importantly, this spate of attacks and calculated mishandling by the Maharashtra Police has made one thing very clear to me. As of now, the likes of Sudha Bharadwaj will have a Colin Gonsalves, a Vrinda Grover, and an Indira Jaising to defend her (and rightly so). But what strategies do all of us as progressive, Ambedkarites, socialists, Leftists and democracy loving people have to keep the BJP out this year in Madhya Pradesh, Rajasthan and Chhattisgarh? Also read: Bhima-Koregaon arrests: Discrediting human rights defenders or real national security fears? I toured 11 districts of Rajasthan in the past four months. Just a day before we were in Phalodi near Jodhpur where 10,000 Dalits and Muslims took a pledge to never vote for the BJP. Agreed, electoral politics isn’t the solution to fascism. But we all must collectively fight it in the political arena too. This is our answer to their ‘Urban Naxal’ plot. 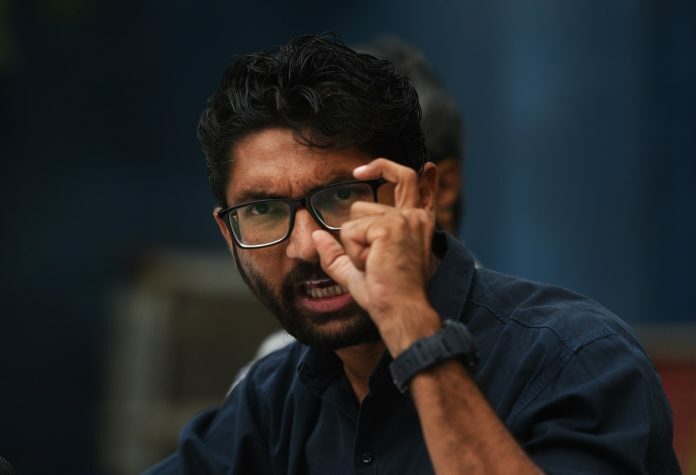 Jignesh Mevani is an independent MLA in the Gujarat assembly and convener of the Rashtriya Dalit Adhikar Manch.